Federated Co-operatives Limited (FCL) was founded in 1928 and is a co-operative of more than 200 independently owned and operated retail co-operatives across the four western provinces. They provide centralized wholesaling and management services to support their members. In addition, FCL owns two independent subsidiaries: The Grocery People delivers fresh groceries to stores and restaurants and the Co-op Refinery Complex manufactures and supplies petroleum products. Chris James, FCL’s Sustainability Manager, says that the co-operative has a long history of implementing environmentally sustainable business practices. The retail stores try to sell environmentally friendly products (e.g. building supplies) and have partnered with SaskPower to offer instant rebates on LED bulbs. The Co-op’s private label water bottles are made from 100% recycled plastic. 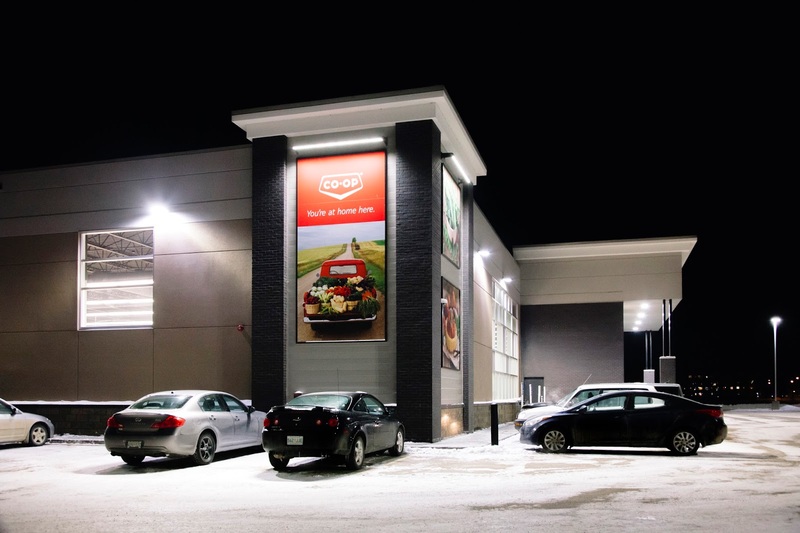 FCL is also considering full LED lighting in all its stores. FCL works with suppliers to be responsible for the entire lifecycle of their products and supports a wide range of recycling programs. The company has led the way by supporting local, sustainable food selling 2.1 million pounds of local produce from 18 Saskatchewan farmers. This ranges from carrots and potatoes to private-label quinoa and lentils. The initiative is expanding into Alberta, Manitoba, and British Columbia. The Sell To Us guide encourages farmers and local producers to supply products to their local Co-op or to distribute them through FCL’s warehouses. FCL has five warehouses (two in Calgary, one in Edmonton, one in Saskatoon, and one in Winnipeg) which store food and building supplies before it’s shipped out to the stores. They’re huge facilities and it really pays to be energy-efficient. There are three main energy loads: refrigeration, lighting, and material handling. “The refrigerated areas are over 200,000 square feet,” Chris explains. “You can drive a car around inside them.” FCL uses ammonia as a refrigerant, which has three main benefits. First of all, unlike fluorocarbons, it doesn’t deplete the ozone layer. Secondly, it’s more efficient than other refrigerants at this scale so it uses less electricity. Thirdly, its distinctive odour helps to detect leaks. Almost all the warehouses are equipped with energy-efficient lighting. FCL switched to battery-powered electric equipment years ago, but they still consume a great deal of energy as some go 24 hours/day. 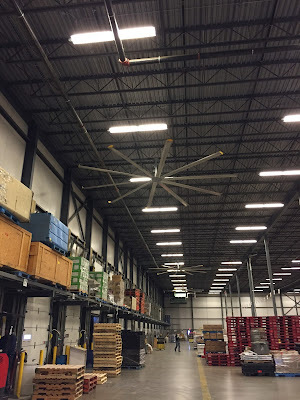 Big fans that push the hot air back down to floor level have resulted in reduced energy consumption for heating. FCL received a 2015 Waste Management Award from the Saskatchewan Waste Reduction Council for its efforts to reduce waste. The warehouses do a particularly good job of waste management. In 2014, 600,000 kilograms of plastic and cardboard were recycled. Plastic waste (e.g. wrap on pellets) is sent to a company that turns it into plastic siding. Cardboard is baled and sold. Batteries go to a recycler that recovers the lead and acid. Steel racking, left over following renovations in 2014, was donated to Habitat for Humanity. The Calgary warehouse has started collecting organic waste, which is eventually turned into fertilizer. Damaged bags of pet food are donated to animal shelters, often through the efforts of individual staff members. FCL has a more formal partnership with food banks. In Saskatoon, they’ve donated approximately 105,000 kg of fresh food that didn’t have enough shelf life to be sent to a store. They also offer the Saskatoon Food Bank & Learning Centre some freezer space for storage. The retail stores provide collection points for CleanFARMS to recover waste from farms (e.g. empty pesticide containers, seed bags, plastic). The stores also offer a rebate to customers who recycle old automotive batteries. “The bulk plant design is well above regulation with many safety features,” Chris says. “We’re really trying to prevent any leaks or contamination. The Co-op Refinery Complex in Regina has undertaken a wastewater improvement project to reduce fresh water use, minimize odours from the wastewater ponds, and recycle 65% of the wastewater. 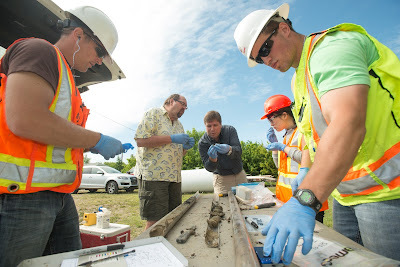 The National Sciences and Engineering Research Council (NSERC) and FCL each contributed one million dollars to create the NSERC Co-op Industrial Research Chair in In-Situ Remediation and Risk Assessment at the University of Saskatchewan in the spring of 2015. The research chair was established to identify sustainable ways of cleaning up sites that have been contaminated with gasoline and diesel fuel. Dr. Siciliano, the recipient of this research chair, and his team will be using natural soil micro-organisms to remediate hydrocarbon contaminants. Simultaneous to creation of the research chair, FCL established the Sustainable In-Situ Remediation Co-operative Alliance (SIRCA), a group of researchers, Canadian universities, and co-operatives in Canada and the United States. SIRCA was created to foster collaborative research to collectively advance research activities into in-situ remediation technologies.